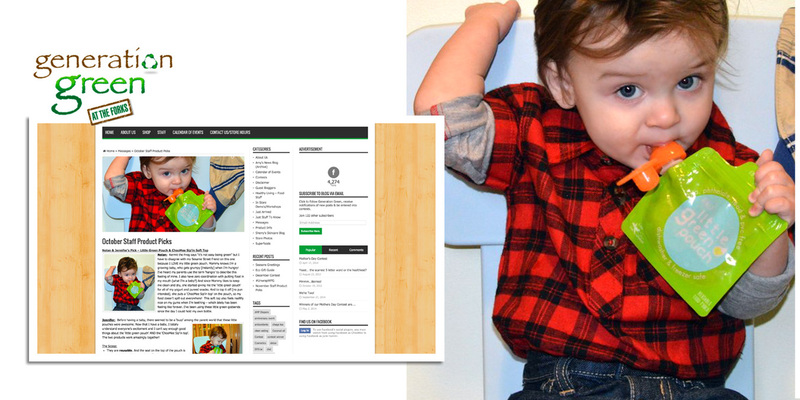 We’re honored, thank you Generation Green for your adorable Staff Pick! Little Nolan: Kermit the Frog says “it’s not easy being green” but I have to disagree with my Sesame Street friend on this one because I LOVE my little green pouch. Mommy knows I’m a growing baby who gets grumpy (instantly) when I’m hungry! I’ve heard my parents use the term ‘hangry’ to describe this feeling of mine. I also have zero coordination with putting food in my mouth (what I’m a baby?) and since Mommy likes to keep me clean and dry, she started giving me the ‘little green pouch’ for all of my yogurt and pureed snacks. And to top it off (no pun intended), she puts a ChooMee Sip’n top on the pouch so my food doesn’t spill out everywhere! This soft top also feels reallllly nice on my gums when I’m teething – which lately has been feeling like forever. I’ve been using these little green godsends since the day I could hold my own bottle. Mama Jennifer: Before having a baby there seemed to be a ‘buzz’ among the parent world that these little pouches were awesome. Now that I have a baby, I totally understand everyone’s excitement and I can’t say enough good things about the ‘little green pouch’ AND the ChooMee Sip’n top. The two products work amazingly together! They are reusable. And the seal on the top of the pouch is strong, and doesn’t become less effective over time. They never stink. From time to time I have left a pouch in my purse, Nolan’s bag, car, etc. with little bits of leftover food and it never held onto the smell. They are dishwasher safe. Although I prefer to wash them in hot soapy water, and rinse them under the tap. They keep your baby or child happy and quiet. If Nolan is fussy, he immediately calms down holding his green pouch. He associates the pouch with something delicious inside, and gets excited when I give him one. We recently traveled to Spain, and these pouches came in handy on the plane, train, his stroller, everywhere! I also use them at home every single day. And of course, no nasty chemicals are used in creating the pouches or tops. The accessories from the company are a little disappointing in my opinion. Unnecessary baby stuff is wasteful to your wallet and the environment. Stick to the pouches and add the ChooMee Sip’n tops. In my opinion, you can’t have one without the other! Generation Green offers eco-friendly, sustainable products for environmentally conscious consumers. They also provide a platform for food developers across Canada, to showcase their products in a market setting. Food demo’s, along with education on the benefits of these healthy food products, will give consumers the opportunity to make informed buying decisions. This type of platform allows food developers to receive instant feedback allowing them to bring a voice with the products, along with the passion that went into developing them.